Following the completion of XL Group plc‘s cquisition of Catlin Group Limited on May 1, XL and Catlin have officially joined operations and launched a new brand, XL Catlin. As of now, XL’s insurance and reinsurance operations will use the brand name XL Catlin. The parent company will remain XL Group plc. XL Catlin’s CEO Mike McGavick said, “We believe that the specialty and complex risk [re]insurance space is where the greatest opportunities exist for a [re]insurance company like XL Catlin to make the greatest impact. “As risks are changing very fast and innovation becomes the most important skill, our new brand reflects our aspiration and what we believe is the real opportunity for XL Catlin to truly break new ground in our sector. XL Catlin’s new marketing campaign – “Insurance for a Bold New World” – reflects the specialty [re]insurer’s commitment to a heightened level of collaboration and forward-thinking to create a new level of insurance innovation needed to address businesses’ complex problems. 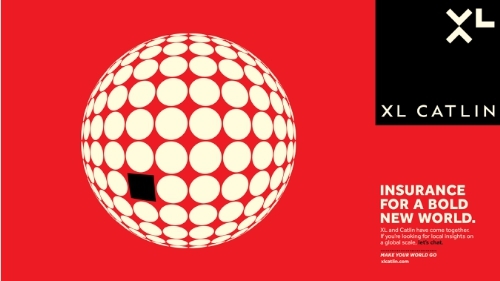 New “Insurance for a Bold New World” advertisements invite businesses to talk to XL Catlin companies about insuring new ideas ["Insure that idea no one has seen yet"], products ["Anyone got any better ideas"] and innovative business models ["Anyone thinking intergalactic tourism"]. Also launched today is the company’s new website, xlcatlin.com, to share information about XL Catlin’s broad product portfolio and new position in the market. The new XL Catlin brand launches today in various business publications, insurance trade journals, online networks, and in placements at major transportation hubs such as London’s Liverpool Street Underground Station, and Frankfurt, Paris Charles De Gaulle, Zurich and Bermuda’s L.F. Wade International Airports. XL partnered with Venturethree, a London-based global brand studio, to develop the new brand, with London-based creative agency Atomic London to create and design the advertising campaign, and with Investis, an international digital corporate communications and investor relations company, in launching the new xlcatlin.com.